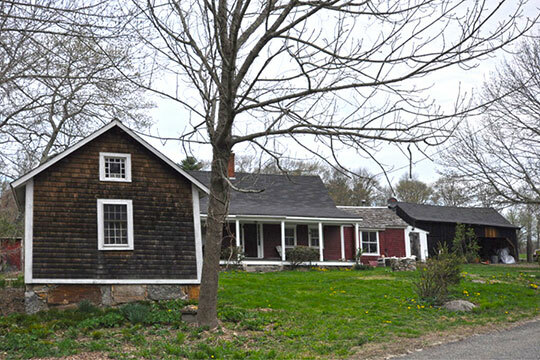 Foster Town Hall is located at 181 Howard Hill Road, Foster, RI 02825; phone: 401-702-5010. Photo: Borders Farm, ca. 1840, North Road, Foster, RI. Listed on the National Register of Historic Places in 2009. Photographed by User:Magicpiano (own work), 2015, [cc-by-4.0 (creativecommons.org/licenses/by-sa/4.0/deed.en)], via Wikimedia Commons, accessed June, 2015. Foster is rich in resources; historic houses, farmsteads, roads and mill ruins, and in the natural beauty of its setting; brooks, waterfalls, woods, swamps, and the plant and animal life they shelter. All of these resources are fragile, and most of them are non-renewable. All of them are threatened by development. The Town's rugged topography, generally poor soil, and small-scale streams, coupled with its isolated location twenty (20) miles west of Providence, have largely determined its historical and physical development, delaying the initial colonial settlement until about 1704 and town incorporation until 1781 and contributing to a period of decline and outmigration which lasted from the late 1820s until the early 1950s. The location of the town within easy automobile commuting distance to Providence and major employment centers has brought significant development pressure in the last decade. The face of Foster's landscape has changed dramatically in the last two hundred years. Originally covered with hardwood forests, Foster, by the early nineteenth century was almost totally cleared, a result of both agricultural endeavors and forest processing industries. Today much of the land has reverted to forest, and only the seemingly endless stone walls leading away from the roads, numerous scrub-grown cellar holes, and old photographs showing hayfields instead of trees indicate the extent of the change. In the nineteenth century, farm complexes were spread across the landscape. At key focal points pivotal cross roads, usually located near the local saw or gristmill, villages grew up. Hopkins Mills was the first to develop in the early 1700s. Foster Center, the present seat of government, developed later in the eighteenth century, and it was here that the first Foster town meeting was held in 1781. The villages of Clayville and Hopkins Mills took form in the early nineteenth century as did hamlets in Moosup Valley, North Foster, Foster Center and Mount Vernon. These hamlets and villages were linked to each other by a series of roads which turned and jogged around natural features; wetlands, rock outcroppings and farmer's fields. Many of these roads have resisted modern straightening and about a third of them remain one lane wide and still unpaved; others are a minimal two lanes wide. Most are lined with stone walls and edged either by open fields or, more often, by fern- and wild flower-filled woods. They exist in relation to the land much as they did when first laid out in the last half of the eighteenth century. Foster, Rhode Island, Statewide Historical Preservation Report P-F-1, Rhode Island Historical Preservation Commission, 1982, in Foster Comprehensive Plan, 2003 Update, www.townoffoster.com, accessed June, 2015.